With doing the journal and trying to keep on top of my letter pile I haven't read a book for this week even though I started Les Miserables but might save it for a holiday as there seem to be about 10+ pages per pecentage and I'm still only on 1% so I could be here until Christmas if I read a little every night. Its a book I've always wanted to read as I've heard the musical is great but I don't have the energy to go and see it. Instead I'm going to post these last few photos of my adventures last Monday. As I've mentioned many times before I love love love the olden buildings in our city with their stone carved and solid brick buildings. I just hate the thought of them knocking a lot of them down to make way for houses and other such things as they just don't feature in the city. I've actually been in the city hall twice, the last time was actually 2 months ago but I'm going to tell you of my first experience of each room that we saw. We went up the stairs and there was a desk there with a lady to greet us, on either side of her were stone steps and we went up one set to a huge hallway area with artefacts etc displayed. From there we went into the banquetting suite which was set with a horse shoe shaped table with a bright white table cloth and all the dinning ware as if the queen was coming to eat. We then went to a Victorian school room which was set exactly like it and a person acting like a teacher. Then from there to a mini version of the houses of commons with green leather seats and brown marbled effect wood. That time we stayed to have lunch there in one of the rooms and the rest of the building wasn't nice, it reminded me of an old fashion school corridors with echoing etc... but the room we had lunch in was just like any room anywhere. Lastly we went to the Lord Mayors Chamber which is like an over cluttered and fussy old fashion room with all kinds of antiques to tell the story of the people who have been there but it was nice. You can't see it in this photo but they spent £22 million building a lake to the side of this building which they plan on freezing over in winter to create an ice rink. The water can be adjusted in height so at times it just looks like puddles of water with water fountains and a path down the middle, other times its full but I haven't see it like that even though I have a postcard to offer on make my day one day with it on. 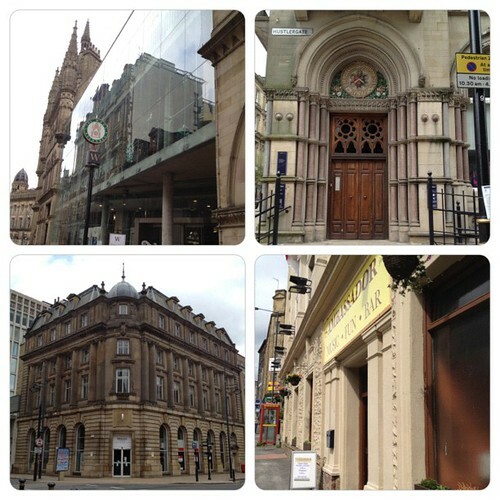 The first photo is the wool exchange where people exchanged wool in the olden days. Now it is Waterstones the bookshop, Starbucks and a few other stores. I have only been to Waterstones though and its so impressive inside with all its black bookshelves all lined neatly with books but also the ceiling is so pretty that I wish I'd had the guts to take a photo of it. Even though you just walk up the stairs to Starbucks I've never been. The second and Third buildings are both banks, there is another bank that I didn't photograph that is also lovely but that bank is more impressive inside as it has a carved and painted ceiling with a mural. The last one I was just walking by and decided to photograph. 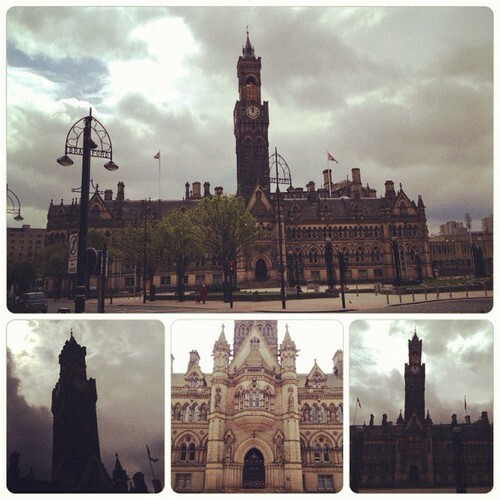 There are many impressive buildings but I was too lazy and cold to walk to all of them. I wish now that I had taken photos of some of the buildings I really dislike and on top of it they are empty. I hope you enjoyed looking at our once very striving but now almost dying city centre as people now travel to other cities to shop which may mean we'll never really get anything back here. What do you think of the town, city or village that you live in? I think many of the older buildings are impressive compared to buildings built now days.